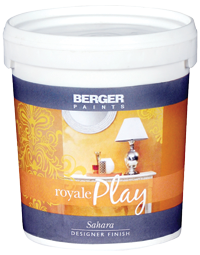 This Royale Play designer finish recreates Africa’s lush forests, vast grasslands, and mighty tumbling rivers on your walls. The frosty mountaintops of Kilimanjaro and the Cape, the endless miles of oceanfront from Mombasa to Mauritania, will now all serve as your décor inspirations. Capture a continent’s moods and colours through Safari variants such as Classic, Rain Storm, Ocean Wave, Sleet and Frost. Make every moment as exotic as the African islands that inspire this Classic finish. Bring the freshness of a winter morning into your home and state of mind with Frost. Emulating the spirit of the ocean, the Ocean Wave effect is peaceful and yet comes alive. Both horizontal and vertical effects of Sleet promise to bring tranquility. Proving that there's beauty in chaos, the Rainstorm effect brings vigour to your room. Surface preparation Clean and sand the surface, if needed. 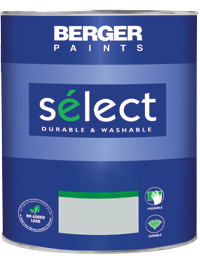 Prep it with one coat of Berger Alkali Resistant Primer, and two coats of Berger Stucco. 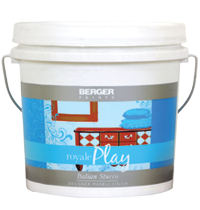 Application procedure Base Coat: Use two coats of Royale Matt in the shade selected for your Royale Play Safari combination. 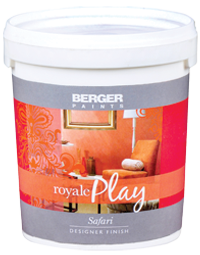 Top Coat: Apply the ﬁrst coat of Royale Play Safari with a roller. Final Coat: Apply Royale Play Safari in 2 ft x 2 ft sections, with a slight overlap. Use the recommended tools and create the pattern before it dries. Sleet and Ocean Wave require one top coat. Classic, Rain Storm and Frost require two.